EcoGlo Mineral Makeup is 100% natural, a healthy alternative for looking amazing! Say goodbye to clogged pores and say hello to cleaner skin. 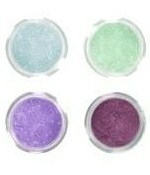 EcoGlo Mineral Makeup is very light and feels natural while never clogging pores and free of oils, silicone, and waxes. EcoGlo's philosophy is natural beauty, by creating all natural makeup that is chemical, preservative, and cruelty free products. Their products include foundation, blush, and eye shadow, concealer, bronzers, brushes and applicators, and so much more! Their products are made in the U.S.A. Mineral makeup has been around for decades quietly gaining recognition for its healing and beautifying properties, but only in the last few years has mineral makeup become a mainstream cosmetic solution for those seeking to leave synthetic and chemically laden make up items behind in pursuit of a cleaner and more natural alternative. Mineral makeup does not contain any synthetic ingredients. It is made only of minerals found naturally occurring on the earth. Many consider mineral makeup to be pure enough to sleep in at night as there is nothing irritating in the makeup to cause skin problems such as redness or breakouts after a good night’s sleep. Mineral makeup is approved for use after chemical and laser peels. The intense cosmetic procedures leave the face a bit raw and irritated, and applying even concealer over the red skin will cause burning and itching from the chemicals it contains interacting with the exposed skin. Mineral makeup, however, is gentle enough to blend into the skin and help to conceal the less attractive side effects of the beautification process. Many cosmetics seem to age skin more – if not literally though toxins and chemicals, than through appearances when power and foundation products pull down the winkles of the face and settle into the small lines making them appear much larger. Mineral makeup is light enough to dust the face rather than settling in. This helps faces of any age to appear more youthful and refined. The two most prominent ingredients in mineral makeup, zinc oxide and titanium dioxide, have natural UVA and UVB blocking properties. Therefore materials made from these products, which included mineral makeup have the same sun fighting properties. There is no longer any need to wear a greasy sunscreen product under your makeup. You can simply dust on your sunscreen at the same time you’re starting your morning makeup routine. Those with ongoing skin conditions such as acne, rosacea, and eczema all rely on mineral makeup products to help soothe flare-ups while looking fabulous at the same time. Not only does the mineral makeup block the damaging sun which can be hard on problematic skin, it also works to actually soothe and possibly heal the problem areas through a natural combination of the Earth’s minerals. When applied, mineral makeup is known for its extremely lightweight yet very generous coverage. Dust powder on and you can’t feel it on your face. Even after a long day, mineral makeup stays put to continue providing you a refreshed, glowing look without the weight of a “full face of makeup” wearing you down. I received 4 eye shadows, 1 blush with a brush and a concealer for review. I have to say that I'm in love with everything I tried. I have sensitive flaky skin because of my PCOS, but I have no problem wearing this make up. I was hesitating at first about the concealer and blush, since powders normally enhance the fact that I have dry flaky skin. With EcoGlo Minerals my skin looked hydrated, had an even tone, and looked healthy and natural. I received make-up, in exchange for my honest opinion, and a review of my experience. I did not receive any other compensation or incentive nor was I required to write a positive review. Individual results or experiences may vary. i ordered some of there makeup and i like it..